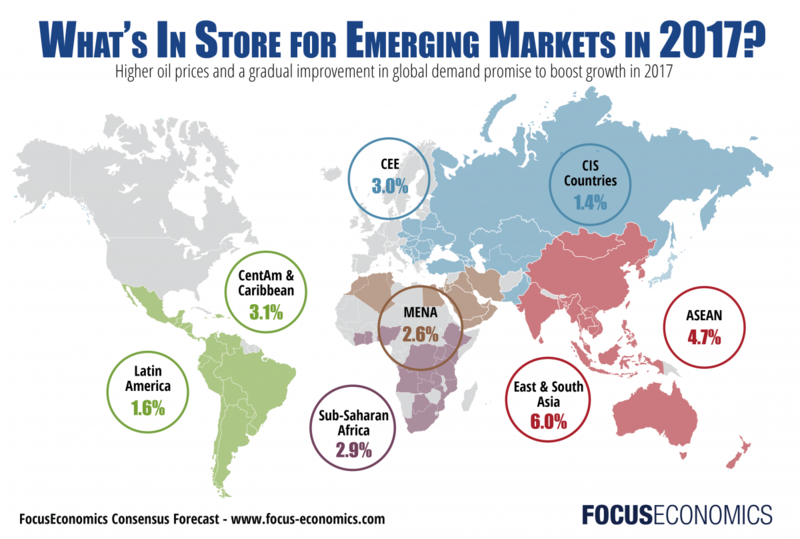 Home > Blog > What are the prospects for Emerging Economies in 2017? 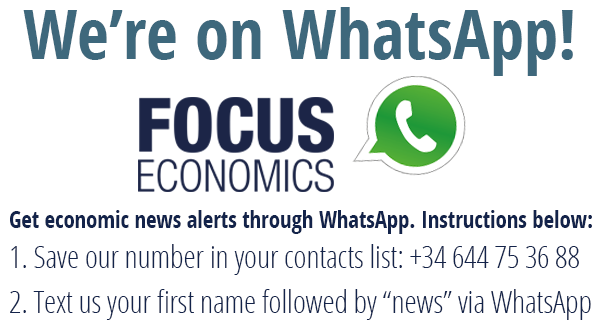 After expanding 4.0% in 2015, emerging economies grew by an estimated 3.9% last year, according to FocusEconomics’ Consensus Forecast. Economic growth was supported in 2016 by improving commodity prices and a broadly stable U.S. dollar. China’s economy proved more robust than initially feared and the recovery now looks to be back on track in Brazil and Russia. The economy fared relatively well in East and South Asia (ESA) in 2016 due to resilient growth in China, which was supported by bold policy support and strong private consumption. The ESA region expanded 6.1% in 2016, down from 6.3% in 2015. Meanwhile, the Association of Southeast Asian Nations (ASEAN) managed to accelerate in 2016, despite weak external demand, political events in Malaysia, the Philippines and Thailand, and swings in financial markets. ASEAN grew 4.7% in 2016, up from 4.5% in 2015. This year, all eyes will be on a possible trade war between China and the United States, if President Donald Trump moves forward with his plans to impose a tariff on Chinese imports. A conflict between the world’s two largest economies would have a sizeable impact on Asia given the importance of its external sector. Moreover, improving growth prospects for the U.S. could lead the Federal Reserve to accelerate its tightening cycle, fueling volatility in the region’s financial markets. On the upside, the expected fiscal stimulus plan in the United States, coupled with bold government support in China, has the potential to boost global demand, which bodes well for growth in the region. Price pressures are expected to pick up across Asia this year as a result of the increase in commodity prices, a low base from last year and scheduled changes in administered prices in some economies. While inflation in ESA will increase mildly from 2.4% in 2016 to 2.7% this year, the pick-up in ASEAN will be more pronounced and inflation is expected to rise from 2.3% in 2016 to 3.2% in 2017. Economic activity in the Middle East and North Africa (MENA) region showed surprising resilience in 2016 as stronger dynamics in oil-importing countries and Iran offset a poorer performance among the Gulf Cooperation Council (GCC) countries. Oil-importing nations benefited from low commodity prices and accommodative monetary policies in the region, while Iran benefited from its reintegration into the global economy. Conversely, harsh austerity measures due to the fall in oil revenues dragged on growth among the GCC economies. MENA expanded 2.7% in 2016, down from 2.6% in 2015. This year, growth will remain subdued as the positive impact of the rise in oil prices among crude-extracting countries will be partially offset by lower production as a result of the implementation of the Organization of the Petroleum Exporting Countries’ (OPEC) 30 November agreement. Moreover, the region’s economic outlook will be negatively affected by widespread security risks in the region, spillovers from the rivalry between Iran and Saudi Arabia and the as yet unclear economic and geopolitical policies of President-elect Donald Trump. Against this backdrop, our panel of analysts foresees the MENA region expanding 2.6% in 2017. There will be some exceptions to MENA’s gloomy growth prospects. Iran will continue to expand at a healthy rate due to higher oil revenues and rising foreign investment, following years of tough economic sanctions. The Moroccan economy will recover sharply from last year’s dismal performance due to severe weather conditions. Among the GCC countries, growth in Qatar will accelerate notably this year as the country is benefiting from its diversified economy. Recovering commodities prices and better prospects for the Russian economy should support a return to growth in the Commonwealth of Independent States (CIS) region this year. However, growth is expected to remain weak amid monetary tightening in the U.S. and ongoing geopolitical risks. GDP is seen growing 1.4%, after falling 0.3% in 2016. Economic activity should pick up moderately in Central & Eastern Europe (CEE), where a rebound in investment and an improving labor market are seen fueling GDP growth of 3.0% in 2017. Meanwhile, South-Eastern Europe’s (SEE) outlook will depend on security concerns and the political situation in Turkey as well as the ongoing debt saga in Greece. GDP in SEE is seen expanding 2.7%. Inflation stabilized towards the end of 2016 in the CIS region and our analysts see it remaining broadly contained over the course of 2017. Inflation is expected to end the year at 5.5% in 2017. For CEE, price pressures are seen rising as the effect of low oil prices wanes and our analysts project average inflation of 1.5%. SEE will see average inflation of 5.2%. Economic conditions are set to improve across the region this year, and all three regions within Eastern Europe should see faster growth rates. Politics, both domestic and external, will heavily influence Eastern Europe’s growth trajectory this year. In CIS, Russia stands to benefit from new U.S. President Donald Trump and could see an ease in trade sanctions this year, bolstering the economy’s recovery. Meanwhile, political developments in the European Union will factor into CEE’s outlook, as member countries tackle Brexit and heightened uncertainty within the Union. For SEE, political tensions in Turkey will remain at the forefront. The regional economy is expected to accelerate this year compared to last year’s dismal expansion. The main sources of growth will be a gradual improvement in global demand and a recovery in commodity prices. The deal between OPEC and non-OPEC members to cut oil output should ease the global supply glut, put upward pressure on oil prices and support the oil-exporting countries in the region. Growth will nevertheless remain subdued on the back of economic and political challenges across the region. Possible violence and instability triggered by upcoming elections, a lack of much-needed structural reforms and the repercussions of Trump’s expected protectionist policies are all factors that are weighing on the growth outlook. In this difficult climate, economic progress will depend to a significant extent on how fast governments can implement reforms aimed at promoting growth, reestablishing macroeconomic stability and enhancing trade links within the region. Our panel of analysts expects SSA to grow 2.9% this year and 3.8% in 2018. The FocusEconomics panel expects Nigeria’s economy—the biggest economy in the region—to rebound in 2017 after last year’s contraction. The recovery, however, is fragile and depends mostly upon policy action by the government. Analysts consider that a further devaluation of the naira is key to attract investment into the economy and support domestic demand. Our panel expects Nigeria’s economy to grow 1.3% this year and 3.0% next year. Downside risks also persist in South Africa’s economy—the second biggest economy in the region. Ongoing political scandals, the dire state of the labor market and the potential effect of Trump’s protectionist policies will weigh on growth. On a positive note, a gradual improvement in the world economy and a recovery in commodity prices will support South Africa’s economy. On balance, the FocusEconomics panel expects GDP to expand 1.2% in 2017 and 1.8% in 2018. Central banks in the region will continue to maintain a prudent stance in the trade-off between returning inflation to target and supporting economic activity. The Central Bank of Nigeria will likely ease its monetary policy as the exchange rate market normalizes. Likewise, the South Africa Reserve Bank will opt for accommodative policies this year unless shocks such as a possible downgrade to the country’s credit rating lead to a further weakening of the rand. Latin America is projected to expand 1.6% this year, after contracting 0.7% in 2016. Compared to other emerging markets, Latin America will undergo a larger turnaround in 2017, with an estimated 2.3 percentage-point upward swing to growth. The recovery will nevertheless still be somewhat underwhelming and, as 2017 gets underway, increasing risks are casting a shadow on the region’s outlook. Going forward, growth is projected to pick up to 2.5% in 2018. While a positive impulse will come from an improvement in global economic growth—fueled mainly by a stronger U.S. economy—and a gradual recovery in commodity prices, higher U.S. interest rates and uncertainty stemming from changes in U.S. trade and immigration policies have the potential to derail the region’s recovery. The extent to which these factors will impact individual countries varies across Latin America. While domestic factors will continue to dominate the economic performance in most countries of the region, Mexico and Central America and the Caribbean are by far the most exposed to risks from the U.S. The rebound in 2017 will largely be driven by Argentina and Brazil, which are projected to emerge from recession. The recovery in Argentina is expected to be the more meaningful of the two, with GDP swinging to a 3.0% expansion. Brazil, on the other hand, is seen expanding a tepid 0.7%. The economies of Chile, Colombia and Peru are projected to accelerate in 2017, whereas Mexico’s growth is forecast to deteriorate. It remains to be seen how strong the impact of the U.S. government’s policies will be on the Mexican economy.